Fred Hoshiyama was born in 1914 in Livingston, California, where his parents helped to establish a farming community called the Yamato Colony. At the age of eight, he lost his father and had to help his mother on their “dirt farm.” He was attending University of California, Berkeley, when Pearl Harbor was bombed. 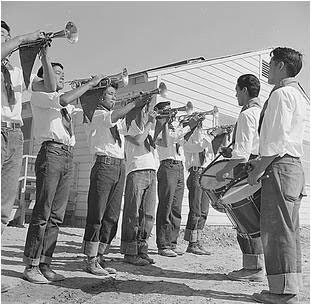 At the Tanforan Assembly Center, California, and the Topaz incarceration camp, Utah, Fred organized YMCA programs for the young people (photo is of Boy Scouts at Topaz). His work in camp was a prelude to a lifetime career with the YMCA. Most notably, he developed NYPUM (National Youth Program Using Mini-Bikes), a program aimed at engaging high-risk youth in productive activities. In his interview excerpt, Fred describes how social differences were equalized in the incarceration camps.